Artist applications for 2019 now closed! Only short-listed candidates will be contacted for our 2019 selection. 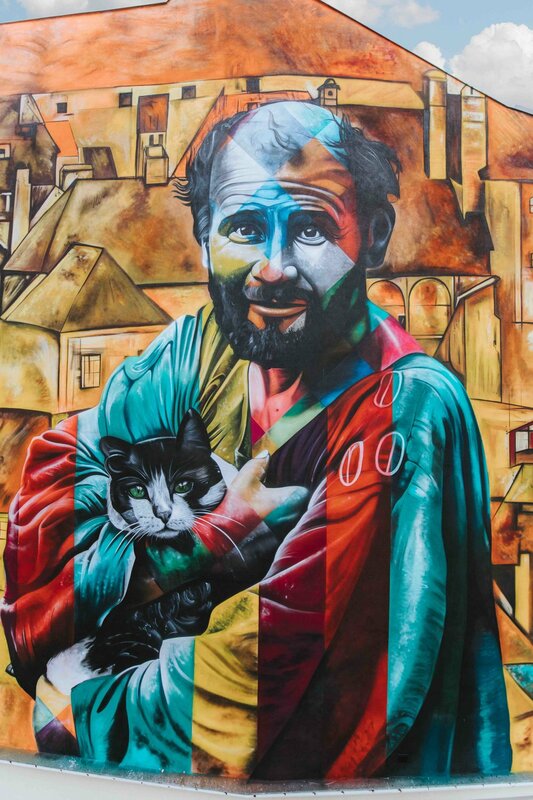 In his first work performed in Austria, the Brazilian artist Eduardo Kobra will use his style and his colors to celebrate two of his main inspirations, two great Austrian painters.Kobra decided to reinterpret the famous photograph of Klimt with his cat, Katze. With an interesting detail: they will be standing on the roofs of Schiele's famous Krumau - Crescent of Houses (The Small City V). You can easily recognise the work of Zësar. His expressive colors and the depiction of his unique characters make him an outstanding representative of the Spanish street art scene. He designs various imagery for T-Shirt collections and limited screenprint editions and works on exhibitions. Oscillating between Uruguay and Spain and travels often too participate at Festivals. In his wall at Ludwig Hirsch Park he paints an homage to Gustav Klimt and Egon Schiele depicting two figures simulating schiele himself and one of Klimt´s muses. Next to them Zesar puts a guitar referring to late Hirsch, who was a famous Austrian musician. The wall shows typography saying Im Werd referring to he ancient name of the district. This year’s Calle Libre theme being CINCO (five), and having just read Elizabeth Kolbert’s The Sixth Extinction a few months ago, Saddo decided to illustrate the so called Big Five, the main mass extinctions in Earth’s history, through one representative species that found their demise in each of the five events. He implements sea creatures, the trilobites, the tabulate corals, conodonts and dinosaurs. Jacoba Niepoort’s mural is a tribute to the creative process, as well as to the work and inspiration of previous master artists from Vienna. It portrays a woman, overturning rocks, searching for her long lost 'sons' of creativity at the bottom of a river. The image is inspired by an old folklore tale (La Llorona) among which one interpretation is the searching for creativity in a river (or soul/body) blocked or muddied by life’s constant internal and external challenges and distractions. One could see the search as part of the never-ending cycle of the creative process. The backdrop to the mural is Koloman Mosers artwork, an artist whom, among others from the Vienna Secession, died 100 years ago. The idea for the piece that was created in Vienna came out from a proposal of the festival’s organizers, who suggested the possibility of respecting the graffiti that were already painted on the wall. For this reason, Medianeras decided to interpret the message of the graffiti artists. The idea was to paint the tags and graffitis on a body with outstretched arms, like tattoos over this painted body. This mural will represent the idea that graffiti is like the skin of cities. The artist chose the challenge of incorporating existing graffiti respecting this urban community. In the middle of the wall we see two fingers which could be interpreted as a reference to the world famous „the creation of Adam“ fresco painting by Michelangelo in the sistine chapel. Unfortunately one of the artist broke her finger while finishing the mural. The Portuguese artist paints a homage to one of Austrias most notorious figures in art history: Egon Schiele. In her colorful interpretation of Egon Schiele´s painting „Am Bauch liegender weiblicher Akt“ from 1917 she also adds a Self Portrait of the painter in the right corner on the top of the wall. While the left half shows colorful abstract elements that resemble floral patterns and plants, the right half of the wall shows a dark horizon sprinkled with distant stars. Jose’s art is a series of interventions on the street with stencil and mirrors. The idea of these pieces is to interact with the viewer using simple and direct phrases and including their reflection in the composition. Jose Urteaga uses the pseudonym of NAF in the urban interventions he has been doing for more than 15 years in different cities around the world. Edwards personas appear all over Europe´s major cities. His stencil-made black and white pieces that he paints in Vienna can be transformed to moving images by using an Augmented Reality App. Watching the wall through your smartphone shows you mysterious Estonian personalities who can be awaken to life. His charakters appeared on various spot throughout the city. They try to establish a new concept which allows you to use digital technology with the artwork in the streets. Akuma Santos (BRA) was one of the first “Graffiteros” in Rio de Janeiro. He often shows figurative symbols which show a political or socio-cultural narrative. Stemming from Rio´s suburb Niteroi he critically examines socio-political thoughts in his colorful and often photorealistic murals. He concentrates not only on painting with spray cans and brushes but has also a strong sculpture influenced approach in his Ouvre. Austrian artist Skirl (AUT) draws most of his work almost exclusively in lines. He has been active in the Austrian Street Art and graffiti scene for years now and works together with different international and national collaborators. In 2016 he co-founded an art collective and gallery space called “Oxymoron” where they regularly host exhibitions and presentations. Situated next to local color store Somogyi this is the perfect combination. If you look at Rodrigo Branco´s (BRA) portfolio you can tell his rich and colorful concepts are heavily influenced by social conditions and imaginary childhood dreams. He works and lives in Sao Paolo but often travels the world to paint murals or exhibit in other countries. The determined motive in his works is the portrayal. His expressive faces often placed on colorful backgrounds give you a surprising view on human beings. His unusual depiction of the human face lets us rethink the perception of ourselves. Chinagirl Tile (AUT) likes to touch political and feminist topics with her work. Working exclusively with tile her artwork must be prepared days in advance and include a three-dimensional aspect to her application on different surfaces. At Calle Libre she collaborated with German artist Loomit and created several drones that were equipped with grenades and bombs, ironically referring to questions of surveillance, war and peoples insecurities. Greek Artist Wake (GRC) speaks about his experience in his home country within his colorful illustrations. He tries to remember actual stories and carries them out to the exact point of telling them in his distinctive way. Knarf (AUT) is not your average joe graffiti writer. His often-abstract black and white drawings emanated from spontaneous thoughts and a playful approach. With his academic background of studying fine art under Austrian artist Gunther Darmisch he has been developing his unique, distinctive style of painting the streets as well as on canvas and other materials. Knarf doesn´t follow any rules of classical graffiti writing and often creates glyphs and geometric elements which allows the recipient to find his own interpretation. Marina Zumi (ARG) was one of the first female artists who started painting the streets in Buenos Aires. Her subjects are often inspired by both nature and animal: they come across as dreamlike landscapes in outer space environment. With her murals, she invites the passer-by to take off for a minute, breathe and dive into her increasingly immersive universe. Marina Zumi believes in natural wisdom, symmetry, quantum theory and the power of color. Her favorite places to work are the streets and large walls that she turns into colorful murals. She paints fairy tale animals, flowers and stars. The artist stresses the importance of symmetry that mimics the balance one should achieve through meditation and self-exploration. 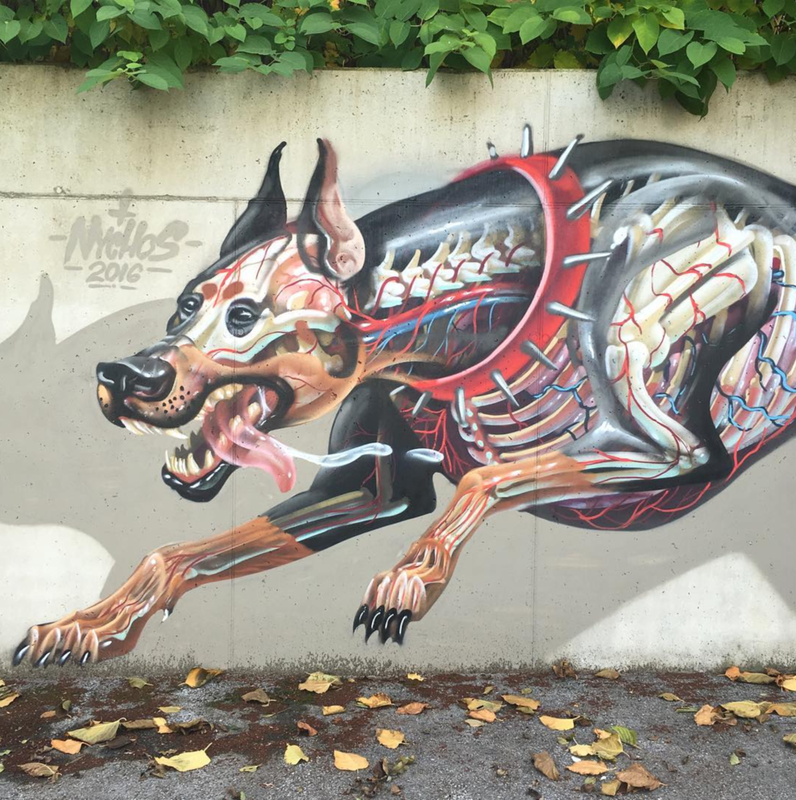 Nychos (AUT) is well known for his anatomically dissected depictions of animals, pop-cultural objects and well-known personalities like Sigmund Freud. Born in the rural area of Styria he now lives and works in Vienna, where he also runs his own Gallery and Art Space under the name of Rabbit Eye Movement. For Calle Libre, he first worked with Marina Zumi (2014) and created a mural in collaboration with the Weird Crew (2016). The 2016 piece was influenced by the Art Nouveau movement of the early 20th century. Fefe Talavera (BRA) gained international recognition through her unique collage technique in which she uses cut out letters to produce oversized “monster paintings”. Her aim is to show the parallels and contrasts between graffiti culture and advertisement. Fefe has been painting the streets of Sao Paulo since the 1990s and she developed an expressive style that integrates cultural allegories from her Mexican heritage. What else is there to say about Loomit (GER). He is a legend, a pioneer and one of Germanys best writers. He has done everything from big wall productions to exhibitions and his ingenious redefinition of modern lettering and typography. He reinvented the depiction of three dimensional letters and has painted in almost every corner around the world. At Calle Libre he worked together with Croatian artist Lunar and Chinagirl Tile on a collective Mural next to DAS WERK at the Danube canal. Zagreb-based Lunar (HRV) began spraying in the early days of Croatian writing culture. He is a well-known figure within the international graffiti scene and has also worked on numerous collaborations with corporate clients and companies. His cat signature symbol shows his comic-inspired and often humorous way of painting in public spaces. Kashink (FRA) is a well-known street artist from Paris, where she started painting more than a decade ago. She is most famous for her drawn moustache that she puts onto her upper lip every day she wanders the surface of earth. She not only is specialised in large scale murals but also includes bright colors and tries to change the public perception of the female body. She trembles our knowledge of beauty and is regularly involved in working together with students or the community. Tyrolean artist HNRX (AT) tries to paint almost every day and is always on the lookout for a fresh wall to attack. His depiction of fruits and everyday objects like a Gameboy, a toothbrush or sushi integrate the errors and unevenness of the surfaces which he paints on. Even though he also shows his works in galleries he doesn't like to work on canvas and prefers paper or carton for his acrylic and marker-based artworks. If you ask him if there is a profound message behind his works he will answer: Yes, it is love, joy and fun. Emerging from a southern province of Italy Millo (ITA) is now travelling most of the time and participating in various festivals and exhibitions around the world. His paintings often broach the issue of living conditions in the modern metropolis. He doesn't use spray cans and almost paints exclusively with brushes on his large-scale murals which are most of the time black and white with only sparse use of color. Venezuelan artist Koz Doz (VEN) always loved to draw. Escaping from uncertain living conditions in his homeland Venezuela he travelled to Europe to present his indigenous influenced paintings which mix portrayals with abstract forms and background colors. He likes to paint on completely different surfaces and always tries to touch upon his mystic and mythic tales and therefore provoke emotional responses from the passer-by. Illustrator and artist Frau Isa (AUT) not only works with spray cans on walls but also loves to draw with acrylic on canvas and design digital art on her computer. You can admire her piece of work on murals, screen prints, invitation cards and magazines. The young, talented artist from Vienna also runs her own company for illustration and graphic design called “Waldundschwert”. The Viennese collective Perfekt World (AUT) tries to include their interest in design and contemporary art in their work as graphic designers. They have shown their art constantly in galleries and even had their own gallery space “Perfekt Box”, presenting international renowned artists, before they dissolved in 2015 and continued their work as individual artists. Colombian artist Stinkfish (COL) is one of the most amazing figures in the urban art scene nowadays. He participated in numberless street art festivals and conventions all over the world and works together with clothing companies, art galleries, cultural institutions and NGOs. He often draws his distinct portrayal of everyday people from own photographs that he took from his past travels. He is also the founder of Colombian Street Art collective APC (Animal Poder Culture) and regularly releases handmade fanzines and poster editions. It is hard to describe Ruin´s (AUT) style. His work is categorized by imaginative characters and colorful background atmospheres with mystical references and dreamlike narratives. He paints tireless in the streets of Vienna and has also shown his work on canvas in group exhibitions. From a small sketch in the hallway to a whole facade his spectrum of work steadily adapts. Graffiti writer and designer BUSK (AUT) gained local recognition through his endlessly reproduced symbol of a monkey head. He then turned his focus to intervention and installation within the urban sphere under the name of CMOD (City Modification). For the last 20 years, he has been active and followed his passion for typography, fonts, throw ups and design. He exhibited in galleries all over the world and has worked in other fields such as merchandise, skateboard or CD designs. The artist couple found their love for art during the early days of classic graffiti writing. They both live in New York and have been active on the street art and graffiti scene since the early 2000´s. They work constantly towards developing their inimitable style. Julia Yubaba (BLR) was one of the first female street artists that received international recognition and is well known for her massive outdoor murals which she creates with her boyfriend Key Detail (BLR). Their work already got published in numerous international books, magazines and publications. The Weird (GER/AUT) was founded in 2011 and combines German and Austrian writers. They all work individually and as a collective. With their remarkable style that often shows comic-like characters that they combine so harmonious even tough each of the artists has his own special way of painting. The character driven approach has led them to collaborate with companies and display their pieces in well reputed magazines, festivals and publications. Even though they are not at the same place the whole time they always find time to get together and excite the public with their one of a kind murals. German artist Mr. Woodland (GER) works as a graphic designer, illustrator and urban artist, he lives near Munich with his wife and two kids. In his early days, he almost exclusively painted throw ups and tags but then converted to figurative paintings. He always tries to tell a story with his visual concepts and convinces with his technique and outstanding style. He often paints people or animals that are mostly in motion and in the middle of an ambiguous situation. As a Brasilian artist with Italian roots, Giuliano (BRA) draws abstract forms of nature and tissue-like textures that align a singular feeling to the concept of black lines. His restless, curved traces give you an imaginative structure that can be interpreted individually and leave open a wide range of analysis. His introverted abstract and organic forms leave the spectator the possibility of his own interpretation. His works seems to flow, like liquid, indecipherable forms of nature that keep you staring.